If you have passed through Lostock Gralam station you will have noticed the large running-in boards that say Take the Train. Walk the Canal. Visit the Lion Salt Works. 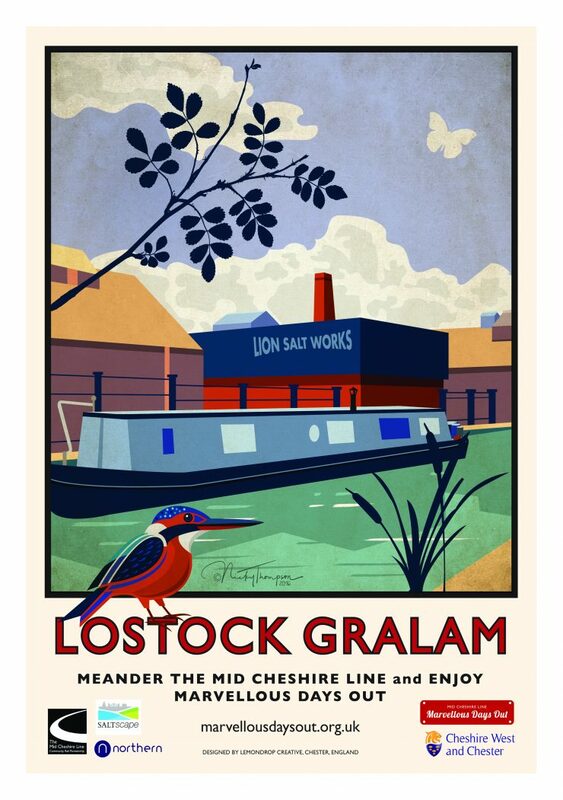 Your trip starts with a 45-minute walk down the Trent and Mersey Canal but please note that the walk may be muddy so good footwear is recommended. It is also not suitable for child buggies and similar. Be sure to give them a wave and look out for the herons and kingfishers on your walk. My wife has close and personal memories of the Salt Works in its heyday because Joan was born in Marston and her granny lived in the house next door to the Works. She would often visit Grandma Buckley and see the “lumpmen” at work skimming out the hot salt crystals into the elm tubs which rested on a rail beside the pan. It was a tough life working the brine ​pans and in the steamy, sticky hot-houses. You can imagine after hours in the Works your throat would be dry and salty as though you had crossed a desert. That is perhaps why at the entrance to the Works was the Red Lion Inn! Grandma would also talk about Mr Thompson arriving early for work, opening his office, and then awaiting the workers to clock in. “The Trust have been working since 1993 to restore the Works.